Chuck Berry ES-350T and George Thorogood ‘White Fang’ ES-125TDC are among the many offerings on tap. NAMM 2019: In addition to a spat of recently-announced new electrics and acoustics, Gibson has teamed up with Chuck Berry’s son and grandson to recreate Berry’s famed ES-350T. 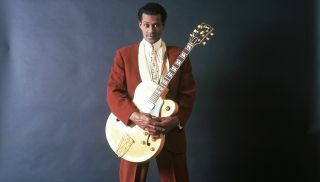 According to the company, Berry’s original guitar was “x-rayed down to the micro-level” in order to craft the new instrument. The company has also reported that several additional signature models are currently in the works. These include: an Epiphone Ltd Ed Thorogood “White Fang” ES-125TDC; an Epiphone Limited Edition Jared James Nichols "Old Glory" Les Paul Custom Outfit; an Epiphone Limited Edition Dave Rude Flying V Outfit; a Custom Shop Dave Amato Signature Axcess Les Paul; a Custom Shop Brian Ray '62 SG Jr.; a Custom Shop Lee Roy Parnell Signature 1959 Les Paul Standard; a Slim Harpo ’62 ES-330 and a Michael Clifford Signature Melody Maker. This new announcement follows the recently-revealed Chris Cornell Tribute Model ES-335. Features of the Cornell guitar include aged Lollartron humbucking pickups, clear “no number” Top Hat knobs, an Olive Drab Satin finish and a Mother-of-Pearl Chris Cornell ‘signature’ peghead inlay. Only 250 will be available, with a portion of the proceeds going to charities in his name.